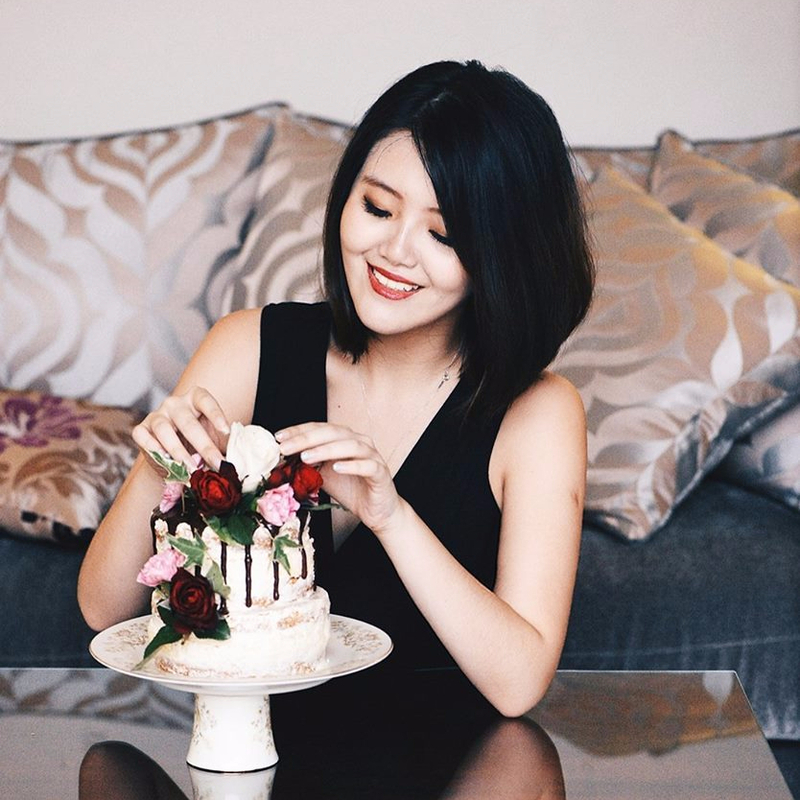 As a restaurant frequenter and foodie, I love Vancouver in its entirety because it features some of the BEST restaurants. I think I can safely say that brunch is probably my favourite meal of the day. Don’t you love waking up to a delicious meal on the weekends? Although I’m not a regular customer, one of the most amazing brunch restaurants I’ve visited is The Red Wagon in East Vancouver. Initially a hidden gem, The Red Wagon only became immensely popular after being spotlighted on Diners, Dives and Drive-ins. On your visits, you can almost always expect a lineup, especially on the weekends. A fellow customer who shared the table with us that day commented that he never used to have problems getting a table right away. It definitely was DDD that brought in the flood of curious customers. I’ll admit that I too, had never even heard of the joint until watching DDD on The Food Network. And after drooling over their featured items in the episode, it didn’t take much more for me to join in the hype! 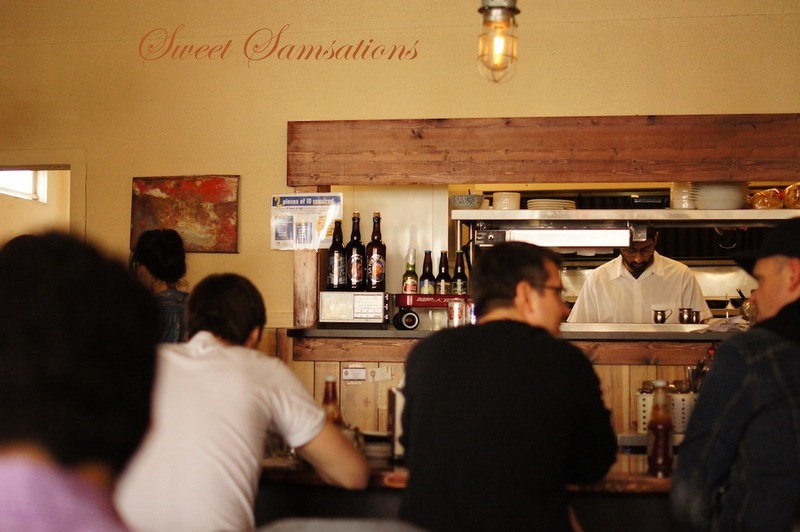 The Red Wagon offers a modern twist on diner classics, such as their famous Pulled-Pork Pancakes and Crisp Pork Belly Sandwich. Needless to say, those were the two dishes we ordered on our first visit. This was really delicious! I can say it did live up to its hype. Thoroughly enjoyed every bit of the sweet and salty mash, especially when it was with a hint of JD! Can’t promise it’d be a great cure for the hangovers though. The dish was really rich! I share Guy’s sentiments when he commented that the dish was probably thought of at 4.30am in the morning. On my visit that day, this seemed like the most popular order. Everyone wanted a taste of these bad boys! Oh gosh, that pulled-pork was just sooooo good!! The pancakes were also super duper soft and fluffy!! Absolutely loved it!! 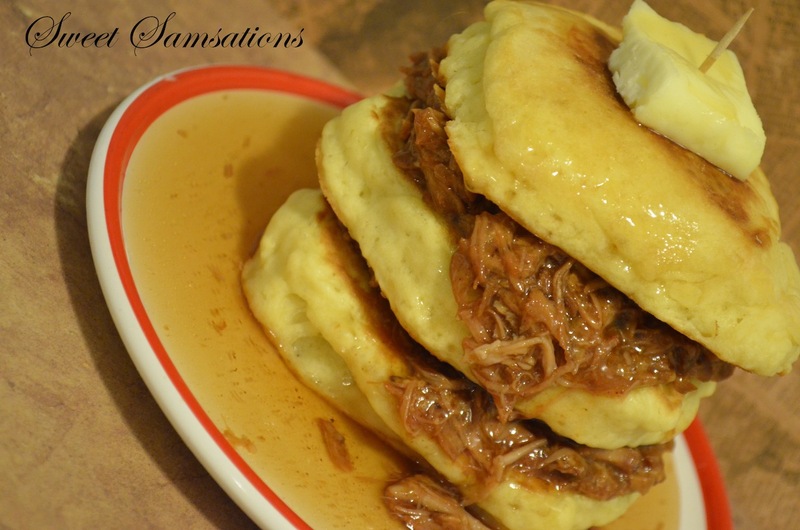 After my visit, I decided to RECREATE the pulled-pork pancakes at home. So, here’s the recipe to the fluffiest pancakes and all-in-all the most sinful breakfast! Combine flour, sugar, baking powder, baking soda, and salt in a large mixing bowl. Whisk egg and butter into “soured” milk. Pour the flour mixture into the wet ingredients and FOLD. Do not overmix. Leave a couple little lumps in the batter so that the pancakes turn out lumpy and super fluffy! Heat a large skillet over medium heat, and coat with cooking spray. Pour 1/4 cupfuls of batter onto the skillet, and cook until bubbles appear on the surface. Flip with a spatula, and cook until browned on the other side. Serve! 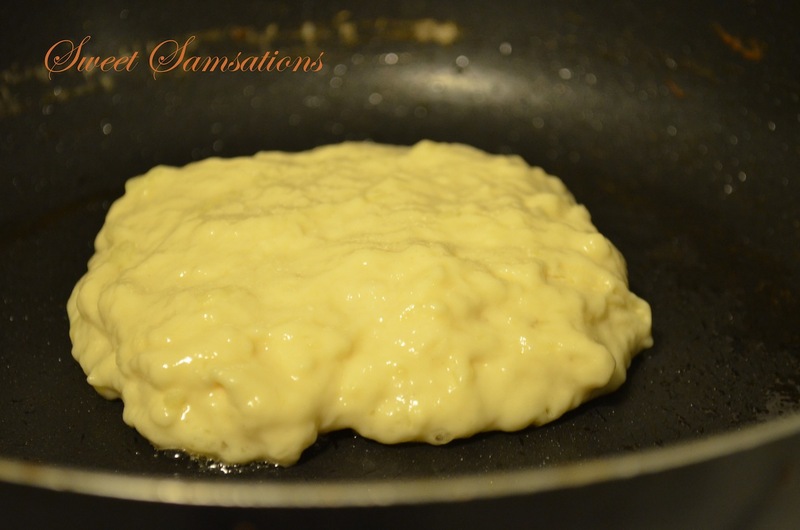 Super lumpy batter for super fluffy pancakes! 1/4 (4 ounce) of your favourite bbq sauce. Rub the mustard over the pork shoulder and set aside. Make the pork rub by mixing the salt, brown sugar, pepper and paprika together. Coat the pork with the rub evenly and set it in a slow-cooker. Let it cook for about 7-8 hours on “auto” . Using 2 forks, shred the meat and stir in barbecue sauce. Heat up the maple syrup until it simmers then add JD. Stir and remove from heat. 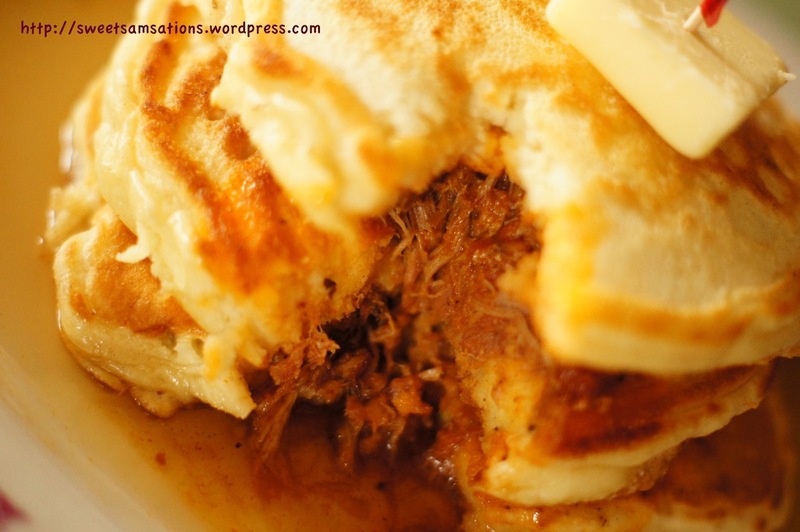 Sandwich the pulled pork between 3 pancakes. Pour the JD maple syrup over the pancakes. Place softened butter on top and stick a toothpick in. Now, I just want you to see how soft and fluffy these pancakes are!! Take a bite if you dare! Ta daaaa!!! I hope you guys enjoyed this! Thought it’d be fun to recreate a restaurant dish at home… 😉 Of course, I couldn’t do an exact replica of it but it was still delish! My sister really enjoyed this! I’d have to emphasize though, that the turnout of your pulled-pork will be heavily dependent on the brand of bbq sauce you’re going to be using! Anyway! Till next time folks! Do visit the Red Wagon if you do pop by Vancity! 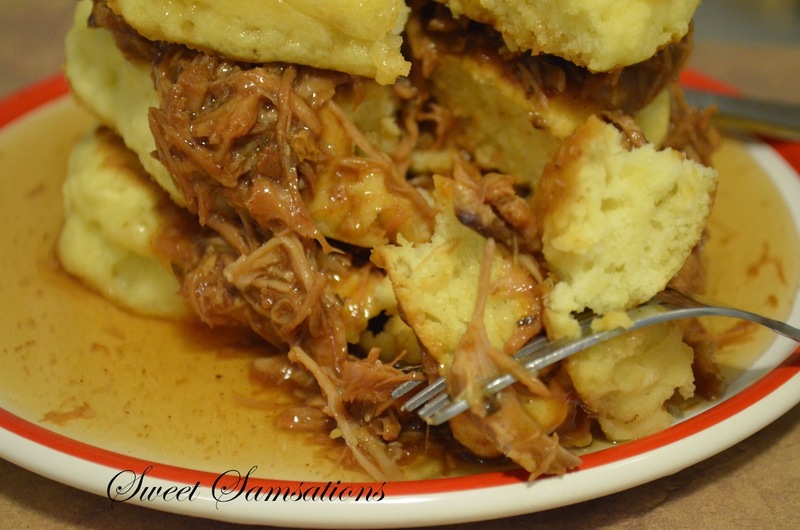 I’m a huge fan of sweet savory mix – I actually just like my pancakes straight up with butter no syrup, but I can see how when you add in that pulled pork it makes it super delicious.. I haven’t seen that DDD episode. This definitely looks like a 4 am meal! YUM! My friends keep telling me about this place, but I still haven’t been yet! um, these are crazy brilliant! I literally salivated as I read through your post and the pictures? AH!!! Sounds delicious, especially the syrup! I would love to dig into this right now. Looks awesome! I’ll take bourbon in my pancake syrup anyday!!! I’m intrigued by the white vinegar in the fluffy pancakes, too! I also see you’ve made friends with the slow cooker! Looks great, Sammie!! What’s not to love about this dish???? 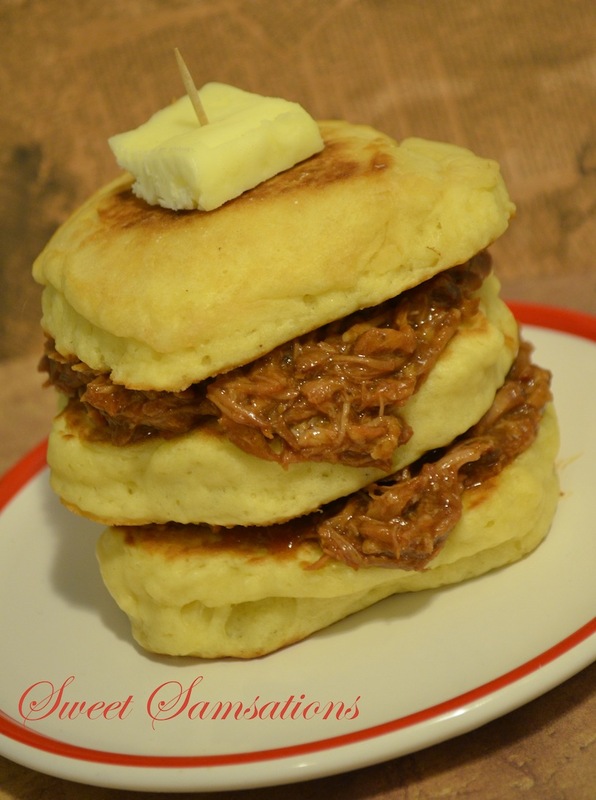 Thick fluffy pancakes, Jack Daniels’ syrup and pulled pork!!!! Phenomenal combination!!! Agree with Liz, what’s not to like about this dish. Would make a great dinner too. your version made me drool! 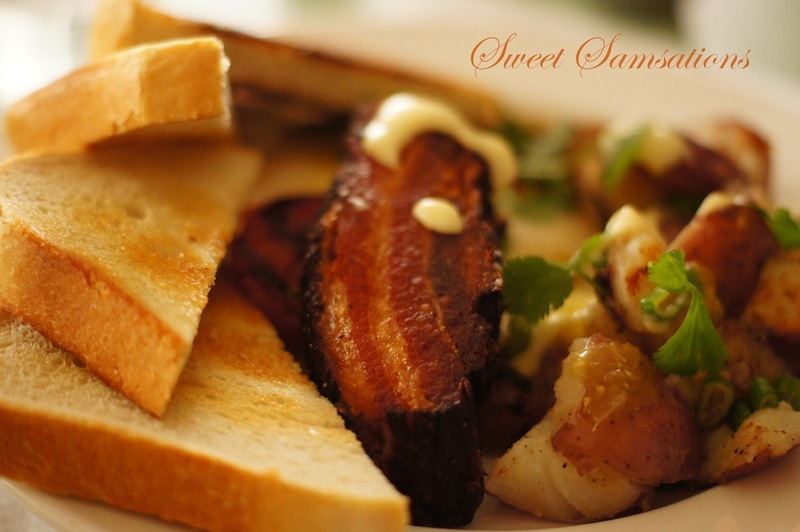 Wow what a crazy mix of sweet and savory! Ooh, I love recreating wonderful restaurant meals at home! Your version looks like it turned out absolutely fabulous. DELISH! 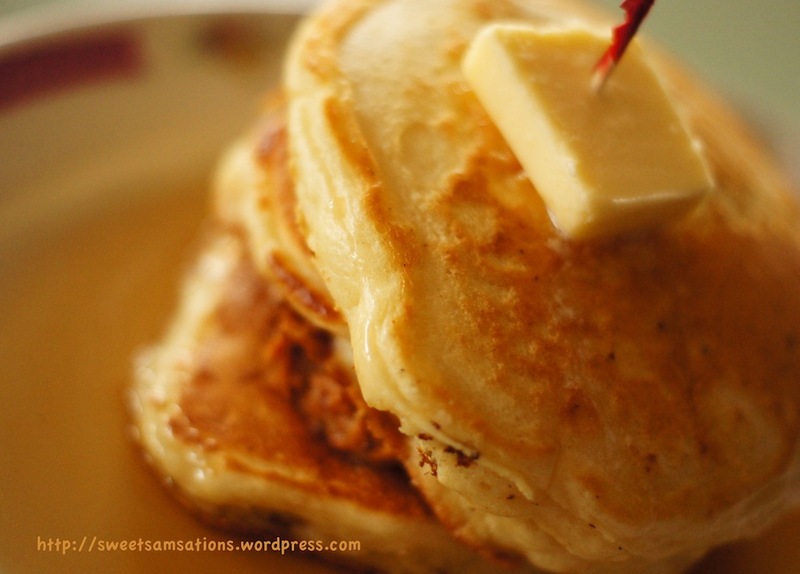 OMG, I wish I could have my fork in these pancakes…they look great…love the idea of sweet and savory all together in one bite…yum! Oh, i feel so hungry just looking at the picture, wish i can have one right now, yum! This is right up there with the fried chicken and waffle dishes, yum! Something about that sweet and savory duo that makes me soooo want to try these. Your photos pushed me to the “must try” category. I am instantly hungry now! Everything looks so amazingly delicious!!!! YUMMMY! Everything about this sounds amazing. And, That restaurant sounds awesome. I would LOVE that crispy pork belly. YUM. What a perfect brunch meal. OMG, Sammie…I could have these for breakfast, lunch AND dinner! 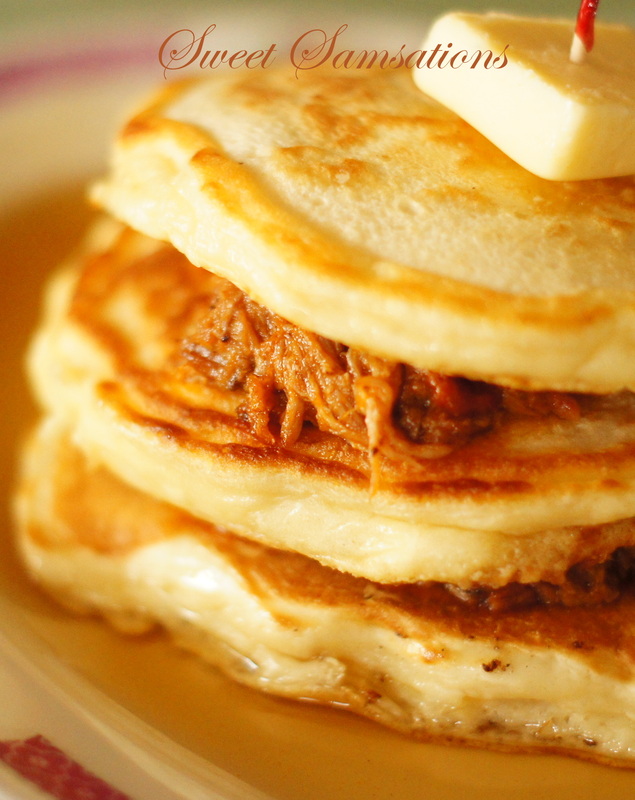 I LOVE the JD maple syrup..what a melange of flavors, and that luscious pulled pork.., sweet and savory, going on in these bad boy flap jack stacks! A breakfast made in heaven! I’m sure my husband will be salivating over this meaty goodness coupled with fluffy, tender pancakes. Wow this looks amazing, thanks for sharing this. gonna give this a go.